ROSSBURG, Ohio (November 10, 2015) – Eldora Speedway and NASCAR have come to agreement to continue the popular NASCAR Camping World Truck Series event at the legendary half-mile clay oval through 2020. The fourth running of the primetime event will take place on Wednesday July 20, 2016 live on Fox Sports 1 and, for the first-time in history, NASCAR has agreed to a multi-year agreement. The only dirt race in the three NASCAR National Series has been well-received by fans, competitors and teams throughout its three year run and the long-term commitment is continued good news for Darke and Mercer counties, West-Central Ohio and the Miami Valley region. Austin Dillon won the inaugural event in 2013 besting Kyle Larson and Ryan Newman. Darrell ‘Bubba’ Wallace Jr., took the checkers in 2014 defeating four-time Truck Series champion Ron Hornaday. 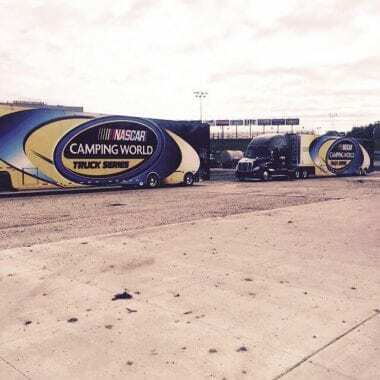 In 2015, NASCAR Sprint Cup Champion Brad Keselowski, Dillon and his brother Ty, two-time and reigning Truck Series champion Matt Crafton and fan favorite Ken Schrader all were entered in the race. But none of them could match up to Christopher Bell and Bobby Pierce, two of dirt track racing’s young lions who put on a spectacular battle for the win. Bell, from Norman, Oklahoma, who races sprint cars and midgets, took the victory after a race long battle with Pierce, who hails from Oakwood, Illinois. Pierce, who finished second, makes a living for himself in dirt late models and won the pole for Truck Series event. It was Bell’s third career Truck Series start, while it was Pierce’s inaugural race in the series. In addition to the Truck race, Eldora announced today that the Super DIRTcar Series Big-Block Modifieds will race a full series points event on Tuesday, July 19 and follow that up with an invitational feature on Wednesday supporting the Truck Series race. The Big-Block Modifieds last raced at Eldora in August of 2006. Other than running in Florida and North Carolina to start and end the season, the Big-Block Modifieds run at dirt tracks primarily in the Northeast United States and in Ontario and Quebec , Canada throughout the season. That will make their trip to Ohio in the summer a must-see event. With the late announcement of the NASCAR Camping World Truck Series schedule, renewal of Truck series tickets will be separate from the Dirt Late Model Dream by Ferris Mowers, the Kings Royal and the World 100 this year. Patrons will receive notification via email and mail when their tickets are ready for renewal. Fans can login to their online accounts, call (937) 338-3815 or visit the Speedway office in person to meet the 11:59 (EST) deadline on Tuesday, December 8, 2015. Renewal forms can also be returned by fax or mail. Renewals also entitle Eldora patrons to participate in Eldora’s exclusive ‘Add and Exchange’ program December 10th (Thursday) and 11th (Friday). Fans that successfully completed their 2015 major event seat and campsite renewals prior to the deadline have the ability to add seats or campsites to their orders or move to another location during this two-day period from any available inventory. This may only be done via calling (937) 338-3815 from 9 a.m. to 5 p.m. (EST). It is not available online. Note that NASCAR ‘Add and Exchange’ will be held later than the ‘Add and Exchange’ for the Dream, Kings Royal and World 100. The NASCAR public on sale date for all new tickets is Monday, December 14, 2015 at 10 a.m. (EST). Best efforts will made to have renewal and new ticket orders received by mid-December for 2016 major events mailed for Christmas delivery. For those interested in camping, Eldora added 450 new campsites and the staff has been hard at work overhauling our existing campgrounds. Since late July 2015, extensive drainage work, all new roadways, raised campsites with professional seeding and even more signage. The biggest overhaul took place in Eldora Village. Tickets and camping for the balance of Eldora’s exciting 2016 season, which will be announced soon, will go on sale Monday, February 15, 2016. Since carved from a cornfield in the natural amphitheater that existed between the Eldora Ballroom and the Wabash River by bandleader Earl Baltes in 1954, Eldora Speedway has grown to be a frontrunner in motorsports growth and stability. Celebrating its 63nd season in 2016, Eldora hosts the biggest events in short-track racing including the 22nd annual Dirt Late Model Dream by Ferris Mowers; the 33rd annual Kings Royal Weekend; the fourth NASCAR Camping World Truck Series race; and the 46th annual World 100. The complete schedule for Eldora’s 63rd consecutive season, including ticket and campsite information, will be available soon at www.EldoraSpeedway.com and can be requested by phone at (937) 338-3815. Fans can get behind-the-scenes access of Eldora Speedway by following @EldoraSpeedway on Twitter, hitting ‘Like’ at www.facebook.com/EldoraSpeedway and on www.youtube.com/EldoraSpeedwayInc. The Eldora Speedway app for the iPhone, iPad and Android is available for free download via iTunes and Google Play.